Without sensors, many everyday tasks, as simple as temperature control in a room to more sophisticated applications such as medical diagnostics and advanced automation processes, would not be possible. Data acquisition systems are required for the conversion of the sensor signals (analog data) into reliable and useable digital data needed for measurement (observation, diagnostics) or control (automation) applications. In the simplest description, data acquisition electronics are required everywhere there is a sensor and that sensor needs to provide digital data to a user or other application. The basic purpose of a data acquisition system is to convert sensor signals (analog data) into reliable and useable digital data needed for modern microprocessor based applications. The data acquisition process utilizes high performance electronics to convert analog signals to a digital form and must incorporate signal conditioning techniques to ensure accurate data is obtained. Signal conditioning can include amplification, filtering, converting, range matching, isolation and any other processes required to make sensor output suitable for processing after conditioning. As digital acquisition systems are being pushed to work in areas where higher accuracy is required, problems such as slow sampling rates, signal noise, and aliasing, limits the resolution and accuracy in the data capture. Also existing architectures are prone to user configuration and design errors that also cause errors in the data capture. 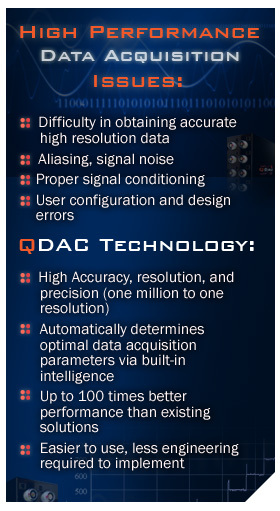 QDAC technology replaces an outdated data acquisition architecture that is based on 30-year old technology constraints. QDAC utilizes a novel and patented approach that addresses the analog-to-digital conversion process by tightly coupling the signal conditioning function with the digital sampling and intelligently (automatically) configuring the data acquisition and signal conditioning parameters. This insures that the necessary and required combination of analog signal conditioning functions are performed correctly, irrespective of the selected sampling rate, and removes the negative effects of signal aliasing. The new architecture also utilizes the minimum possible set of electronic components necessary for the data acquisition, which increases the reliability and robustness of the process. Taken together, the architecture greatly improves performance and accuracy, while simultaneously simplifying the operational use.